When others allow fear of the stranger to gain a foothold in their spirits, and anger directed at others to define them, let us not forget who we are and to whom we belong. 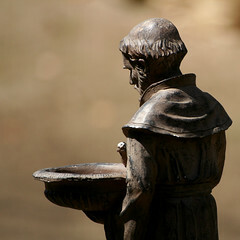 This entry was posted in Ethics, Faith, Prayer, Public Issues and tagged Life Style, peace, prayer, racism, Religion and Spirituality, Saints, St. Francis of Assisi, Tolerance by revbillcook. Bookmark the permalink. We need a reminder once in a while, and this did it! The message is incredibly simple, and yet, we often fail to understand.. I hope we succeed in becoming the instruments of peace.. Personally, i am not religious. But i could appreciate this from a moral perpective. Good that you posted it, Bill. I did too as part of my Radical Sanity series when I first started blogging. People still come to the site to read it. Heartening. and ur dedication and devotion is seen here. The poem has a feel whereby the charm of Roman years come back. A beautiful composition about the no so beautiful prevalent issues..
Comes out of an old manuscript..
please let me know if you are willing to take a position there. do or say nothing otherwise. I adore these words…I once sang them at church years ago in a quartet…the only music being a guitar. It sends shivers down my spine just thinking of it. Thanks for reminding me of that wonderful day and the truth in these words.